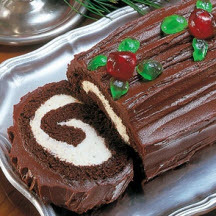 This holiday Yule log features chocolate sponge cake with white cream filling and 'bark' made of chocolate glaze, with a festive garnish of white candy leaves and candied cherries. Preheat oven to 375°F (190°C). Line 15-1/2 x 10-1/2 x 1-inch jelly-roll pan with foil; generously grease foil. Beat egg whites in large bowl until soft peaks form; gradually add 1/2 cup sugar, a tablespoon at a time, beating on high speed of mixer until stiff peaks form. Beat egg yolks and vanilla in medium bowl on high speed about 3 minutes; gradually add remaining 1/3 cup sugar. Continue beating 2 additional minutes or until mixture is thick and lemon-colored. Stir together flour, cocoa, baking powder, baking soda and salt; gently fold into egg yolk mixture alternately with water just until mixture is smooth. Gradually fold chocolate mixture into egg whites; spread batter evenly into prepared pan. Bake 12 to 15 minutes or until top springs back when touched lightly in center. Immediately loosen cake from edges of pan; invert on clean linen towel sprinkled with powdered sugar. Carefully peel off foil. Immediately roll cake in towel starting from narrow end; place on wire rack. Cool completely. Prepare WHITE CREAM FILLING. Unroll cake; remove towel. Spread with filling; reroll cake. Spread CHOCOLATE GLAZE over top and sides. Cover; refrigerate until just before serving. FOR WHITE CREAM FILLING: Sprinkle gelatin over cold water in small cup; let stand 1 minute to soften. Place white chips and milk in small microwave-safe bowl. Microwave at HIGH (100%) 30 seconds to 1 minute; stir after 30 seconds, until chips are melted and mixture is smooth when stirred. Add gelatin mixture and vanilla; stir until gelatin is dissolved. Cool to room temperature. Beat whipping cream in small bowl until stiff; carefully fold into chip mixture. Refrigerate 10 minutes or until filling begins to set. Makes about 2 cups filling. FOR CHOCOLATE GLAZE: Melt butter in small saucepan over low heat; add cocoa and water. Cook, stirring constantly, until smooth and slightly thickened. Do not boil. Remove from heat; cool slightly. Gradually add powdered sugar and vanilla, beating with whisk until smooth. Makes about 2/3 cup glaze. Garnish with WHITE LEAVES and candied cherries, if desired. Cover; refrigerate leftover dessert. WHITE LEAVES: Line a tray with wax paper. Thoroughly wash and dry several ivy, lemon, rose or other non-toxic leaves. Place 1/2 cup HERSHEY'S White Chips and 1 teaspoon shortening (do not use butter, margarine, spread or oil) in small microwave-safe bowl. Microwave at MEDIUM (50%) 30 seconds; stir. If necessary, microwave at MEDIUM an additional 10 seconds at a time, stirring after each heating, until chips are melted when stirred. With small soft-bristled pastry brush, brush melted white coating on top of each leaf. (Use underside of leaf for more distinct vein markings.) Avoid getting white coating on other side of leaf or removal may be difficult. Place on prepared tray; chill until very firm. Carefully peel or tear leaves away from white coating. Place on tray; cover and refrigerate until ready to use.